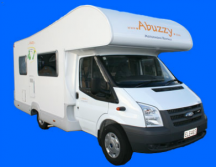 The Abuzzy 4 Berth Grand is a modernised Motorhome with European design and packed with features: four berth Motorhome, a top Ford design, accommodating four people with ample space and storage. Quality campervan models 2008 to 2012 refurbished to modern European design. Toilet canister is a separate tank to the grey water, and as "Certified as Self Contained" so gives you more camping options. The Abuzzy 4 Berth Ultimate is a luxurious four berth Motorhome, Fiat design, accommodating four people with ample space and storage. Toilet canister is a separate tank to the grey water. Is "Certified Self Contained" which gives you more camping options. Vehicle age between 2008 and 2012. The 2013/14 Mercedes Beach 4 berth has been designed with space and comfort in mind. Features swivel seats, 4 burner gas hob & grill, microwave & rangehood, LCD screen & DVD player, internal walk-through and 4m awning. This Mercedes Sprinter 2.2L turbo diesel is 6 Speed Auto Power Steering. Certified as Self-Contained. One Child seat and one booster seat can be fitted in this vehicle, or two child seatsor two booster seats. 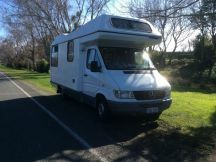 2008 Fiat Ducato, with a 6 speed manual transmission has room to comfortably sleep four adults and is ideal for the family.This 4 Berth self-contained campervan is certified or 4 people and provides you with the perfect base to explore the country. It comes fitted with toilet, shower, fully equipped kitchen facilities and comfortable beds. 1x double and 2x singles suit 2 children or one adult. Up to 2x Baby/Booster seats can fitted. Certified as self contained. Can free camp in designated areas. The Pandora RV offers up to 4 travellers the comfort of a larger vehicle with the added convenience of a unique, electronic bed-lift system that makes manual bed assembly a thing of the past. The large fridge and the optional baby (from 6 months) and booster seats ensure holidays are a breeze for young families in the Pandora RV. Has 2x anchor points for Baby/or Booster child seats. Maximum 2x Baby(from 6 months)or Booster seats, or 1x Baby and 1x Booster seats can be fitted. The Hi5 Camper seats and sleeps up to 5 people. 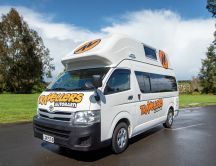 Is ideal for families with young kids or groups of friends who would like to travel around New Zealand. Spacious enough to stand up and move around inside, the Hi5 Campervan is the perfect home-on-wheels for your New Zealand adventure. Toyota Hiace 2009-2014 with interior fit-out in 2018. Features three seats in the front cabin and two directly behind, the kitchen at the back of the vehicle, and a spacious living area. AND, a rooftop solar panel fitted, so you can spend less time and money in powered campsites and more time freedom camping! This vehicle is not certified self-contained if you do not hire the porta potti. Without the porta potti the permit is not valid. Optional hire - Porta Potti hire ($50/hire). This also validates the self-contained certificate permit. Living equipment (bedding, cooking equipment, eating utensils, bath and tea towels) NZ$75/$100 per rental. Please add on when booking. 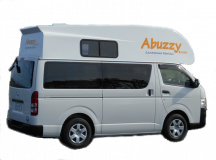 The Abuzzy 4 Berth Top is fuel efficient and self-contained and can sleep 4 adults, with seats up to 6 adults. There are 2 double beds (over drivers cab and convertible dinette area. They are a modern design and packed with features. The bathroom features a fully functioning flush toilet. All kitchen cooking and eating equipment comes standard. Other features include certified for freedom camping and solar power. 2013 - 2016 models with 2017 fit out. Certified self-contained, so gives more camping options. The 4/5-Berth camper has been uniquely and spaciously designed to accommodate up to five people without any discomfort or limiting mobility. 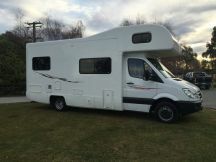 The fully equipped kitchen and dining room is very adaptable and serves dual purpose whereby the whole area converts into one large double bed (can fit 2 children), and with a double bed over the cab, makes the 4/5-Berth Motorhome ideal for a family of five or extended friends. Newly reconditioned with new paint job, new kitchen, new motor and gearbox; the works. You are viewing page 3 of 8.